"Dr. Ashok Rajgopal, Director of the Orthopaedics Department Fortis Hospitals, New Delhi recently conducted an ankle replacement surgery on a 32-year-old woman, who was suffering from pain in her left ankle due to an accident. Dr Rajgopal tells Shikha Swaroop all about the procedure, which is a first for India." How does ankle replacement work? Please give us the details of the surgery ? An ankle replacement works by removing the worn out joint surfaces which are responsible for generating the pain. As a result, the ankle symptoms disappear and when an ankle replacement is performed, the worn out joint surfaces of the end of' the shin bone "tibia" and top of the ankle bone "talus" are removed. This is performed with precise instruments to create a level surface for the implanted prosthesis. The surgeon then places a metal and plastic implant in to the bone ends to function as a new ankle joint. What is the percentage of Indians suffering from ankle related ailment ? Of all the patients visiting a busy orthopaedics OPT, ankle pain and related problems account for 1 5-17% of the footfalls. Is the surgery only applicable to accident cases or also to chronic ankle pain ? Any condition resulting in a painful ankle with stiffness and restriction of ranges calls for a surgical opinion. The causative condition could he long standing injury, arthritis or any related disorder. There are several surgical options available for a painful ankle and the choice of surgery depends upon the condition for which treatment is being done. Is the normal wear and rear or exhaustion of synovial fluid anyway responsible for ankle related ailment? How relevant is arthroplasty in chronic case ? Ankle arthroplasty is the treatment of choice for patients desiring a pain-free and a mobile ankle joint. What is the cost factor of the surgery ? The cost of the surgery is about Rs 2 lakh. How much time does it take to bounce back to normal life after arthroplasty ? Pressure on the ankle replacement must be limited with the use of a walker or crutches for several weeks. Complete recovery from an ankle replacement takes about three months. What is the precaution one should take after undergoing arthroplasty ? Regular exercises are a must in order to strengthen the ankle muscles and to increase the range of movement. The patient should be careful not to fall or twist the ankle. Footwear needs to be comfortable and sensible. The patients would he well advised to wear shoes that fit well and support the ankle joint. Sharp and high heels are to be avoided. The patients should control their weight as far as possible. A Canadian citizen, Mrs. Yasmin Amlani, 39 years lady was admitted under Department of Bariatric Surgery at Fortis Hospital, Noida on 9th Sep' 07. She had a body weight of 129 Kg with height of 5 feet. The BMI of the patient was 54 Kg/m2, which falls into the category of Super Obese. She had borderline diabetes mellitus and depression because of obesity. Team of specialist Doctors from Department of General, Minimal Access & Bariatric Surgery including Dr. Yogesh Agarwal, Dr. Sudhir Sharma, & Dr. Manoj Dokania, Dr. Manoj Gupta & team has performed the surgery. Patient underwent Laparoscopic Adjustable Gastric Banding on 10th Sep' 07. Gastric band is Silicon made balloon device with its inflating port connected via long tube. Gastric band was laparoscopically placed in the upper part of the stomach to decrease the storing capacity of stomach (5 tiny holes made in the abdomen for surgery). Patient was allowed liquids to drink, 6 hours after surgery. The immediate and early postoperative period was uneventful. She was discharged next day after surgery. She stayed in the hospital for three days. And walked out of the hospital comfortably. She came for the first follow up, the initial result showed 7 Kg weight loss, 7 days after surgery. The CME was attended by leading Doctors of the area. Dr.Manoj Singhal and Dr.Vikas Gupta gave an educational talk on Prevention and Management of Chronic Kidney Disease and on Recent Advances in Management of Back Pain. Dr.Singal emphasized on regular screening to detect chronic Kidney diseases at early stages. Patient with diabetes, high blood pressure, old age and family history of kidney disease should undergo three simple investigations including Urine Routine Examination, Spot urine for Micro Albumin and Serum Creatine, once every six months and should seek Nephrologists opinion, if any abnormality seen in a test. Campaign of the Month Obesity is a chronic disease and symptoms develop gradually. It also affects everyday routine activities. Knee aches and backaches are due to joint bearing additional body weight. Obesity if left untreated can lead to life threatening conditions such as type 2 diabetes, high Blood pressure, high cholesterol level, sleep apnea, cancer, menstrual irregularities and infertility in females. Perhaps you knew all this and ignoring it for long. To make people aware about disastrous effect of obesity in to the health Fortis Hospital NOIDA is doing obesity Campaign. For the purpose of spreading awareness in to the lager group we had given an advertisement in the news paper. Small cut, less pain and quick recovery. Minimum Invasive Laparoscopic Surgery at Fortis Hospital, Noida. Laparoscopy, a minimum invasive surgery, is also known as band-aid surgery. It's a modern surgical technique in which operations in the abdomen are performed through small incisions. Commonly used for the treatment of Hernia, Gall Bladder Stone and Piles, this procedure involves less pain and reduced blood loss, leading to a quick recovery. What's more, it requires a very brief stay in the hospital as well. So get rid of painful time taking surgeries and embrace good health with Fortis. "SAARTHAK" A cancer awareness programme called "SAARTHAK" was organized in FHN on 26 April. The session was started with very interactive talk given by Dr.Sunil Gupta in which he discussed on topic 'Tobacco and Oral Cancer'. Dr Jasmine Anandabai talked on 'Chest Physiotherapy'. She talked about the Routine exercise for cancer and answered all the queries raised by the patients and attendants. Dr. Sunil and Dr.Jasmine mentioned that programmes like 'Saarthak' are very helpful for cancer patients. Dr Manoj Rai Mehta gave vote of thanks to Dr Sunil Gupta, Dr.Jasmine Anandabai, and to all the participants for making this programme a success. Notably, an announcement was made in the programme for the Anniversary celebration of SAARTHAK in the month of JUNE. Discover better care by health camp FHN organized a camp for Nehru International School. The students of junior classes were examined. It was multispecialty camp attended by Dr.Prabhat Saxena, Pediatrician and Mr.Girish, Optometrist. The highlight of the camp was that almost 25% students seen had dental, and speech therapy problem The numbers of students screened were about 85. Health Mela 29th February, 2008 Here you'll find an ever growing collection of events organized by People of FHN. Health Mela was organized on 29th Feb by CMO Muzzaffarnagar and FHN participated in this event. doctors Dr. Manoj and Dr.Shantanu participated in this event. Notably, our FHN was highlighted on large scale. This event was coordinated by Mr. Arshad Iqbal, and Mr.Kartik of Marketing Dept. Cancer Awareness Programme The session was conducted by Patient welfare Dept. on 28 Feb. 08.this was regarding cancer Awareness Programme. The Session started by welcome note and followed by prayer to invoke good blessings. Dr.Jasmine delivered talk and started with various relaxation exercises to the patients and attendants who were comparatively weak. Health talk was given by Dr. Mamta in which she discussed the "Importance of CBC in Chemotherapy Patients", which was further elaborated by Dr.Sunil Gupta.This event-Sarthak was highly success. 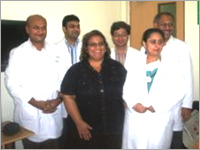 Special Thanks given to Dr.Sunil Gupta, Dr.Jasmine, and Dr.Mamta for imparting knowledge to patients and to all. We have organized a CME on 20th of September at Hotel Holiday In, Agra. Dr. I.P.S. Kochar (Sr. Consultant Pediatric Endocrinology) spoke on "Recent Advances in Short Stature". 60 participants participated in the CME and well received by the audience. We have organized NEURO-CARDIAC CME for ONGC Doctors & also invited doctors from other specialty. CME was started in its stipulated time Total 48 participants has participated in the same Dr. Parneesh Arora spoke on Management of Acute MI-A paradigm shift in 2007' & Dr. Sanjeev Dua spoke on 'Changing Scenario of Backache management'. All the important Dr. Including Dr. Ashish Jain, Dr .K.K.Yadav, Dr.(Maj) AC Sharma-Medical Suptd, ONGC, Mr. K.S.Rawat-GM, ONGC, Dr.Mahesh Kuriyal- Neuro/Director-CMI, has attended the program. Continuous Medical Education A CME was conducted for IMA members at Heritage club, Greater noida. The topic of the discussion was "Pulmonary Embolism" by Dr.Vineet Bhatia from dept. of cardiology and How you will approach in Lump Breast turn out to be a C A Breast" by Dr.Sunil Gupta from dept. of Medical oncology. This education session was followed by interactive talk. About 47 IMA members attended this education session and it was followed by dinner. All the attendees were given FHN Newsline, OPD Schedule, and Brochures. This CME was conducted by Mr.Gopal Dutt of Marketing Department.